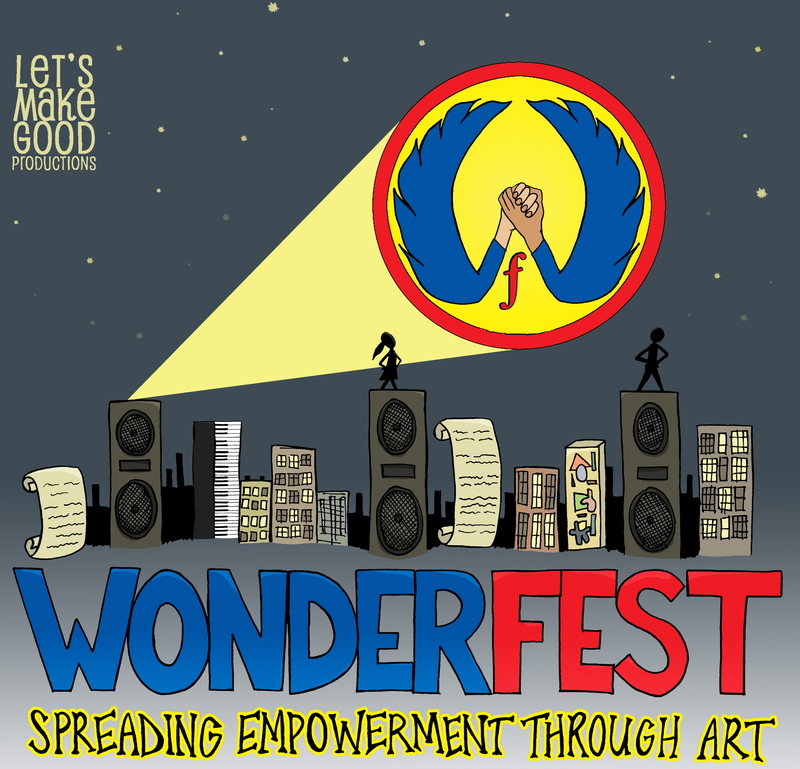 Tomorrow Saturday June 4th, 2016, Let’s Make Good Productions presents another exciting event right here in our city – WonderFest West, where the aim is to spread empowerment through art. 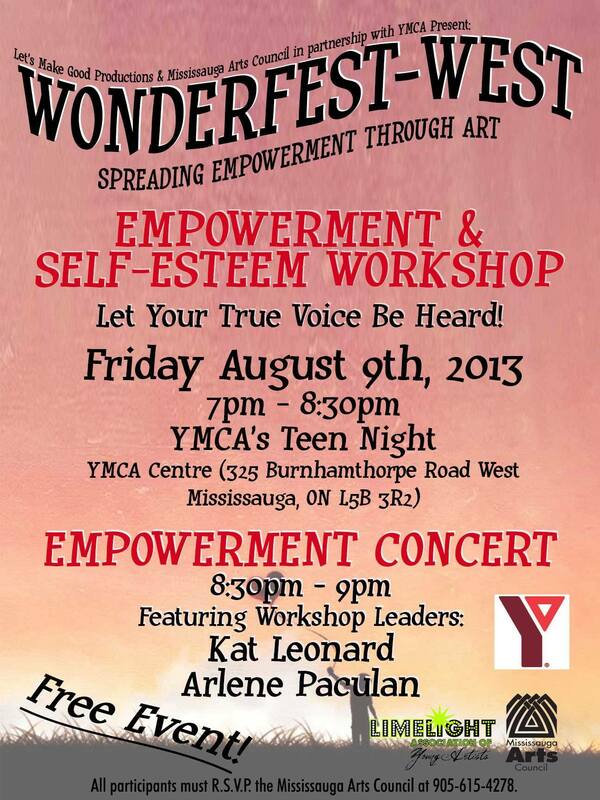 This event is extra special because it will be showcasing many talented artists from the Mississauga area, home to co-owner Arlene Paculan. The event starts off with an incredible dance workshop led by top break dancer and creator of Ground Illusionz, Marcelino “Frost” DaCosta at 4pm. 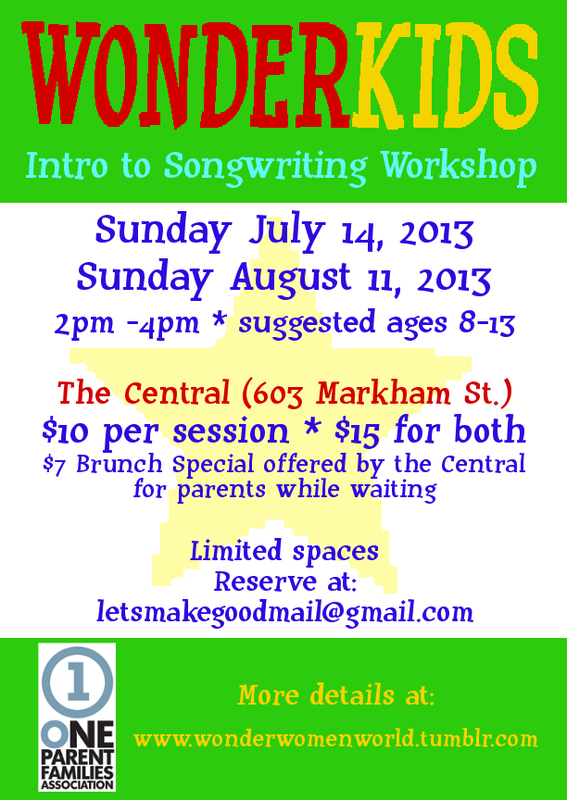 The workshop is free, however, donations for the session will be accepted. 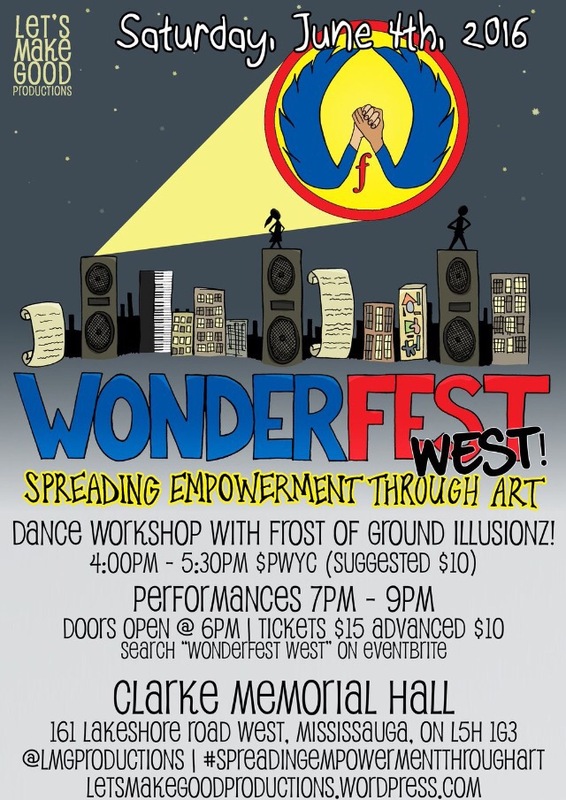 To end the evening, WonderFest West will showcase over 15 artists in a concert at 7pm. You’ll hear from an array of talent and enjoy music, poetry, comedy, spoken word, experience visual art and witness live paintings at the showcase! Advanced $10 tickets can be purchased online until June 1st. Tickets will be available after that for $15 at the door. 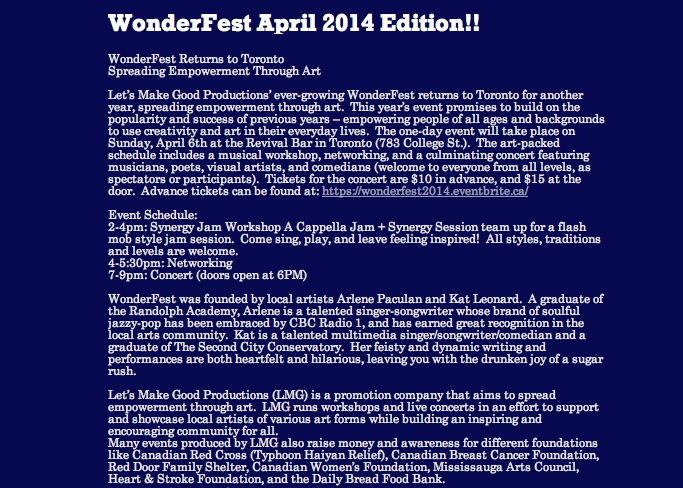 Search WonderFest West on Eventbrite.ca or visit this site. 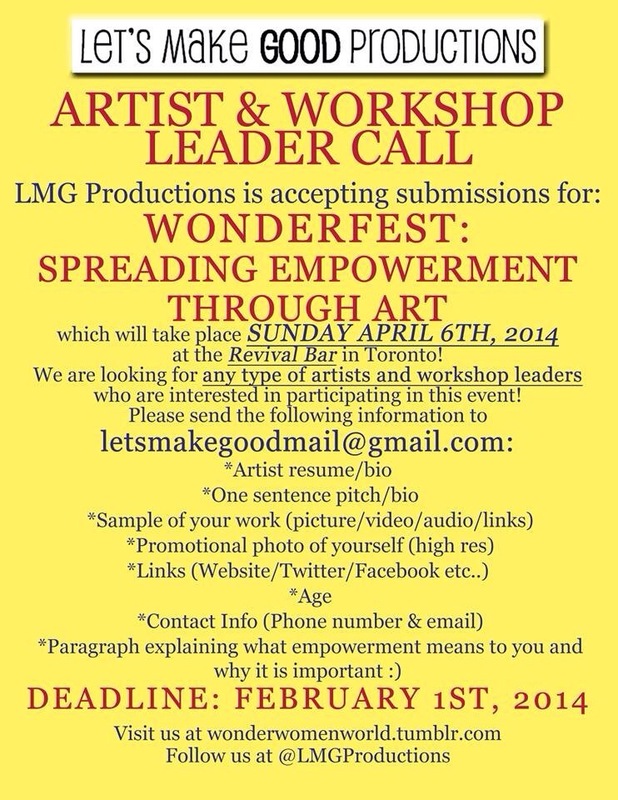 LMG Productions hopes to inspire and encourage participants and the audience members to allow themselves to share their creativity, or even rediscover it again if they have forgotten their love for being creative. Click here for WonderFest 2014 artist info! Click here for advance price tickets! Click here for Arlene and my interview with Life With More Cowbell! 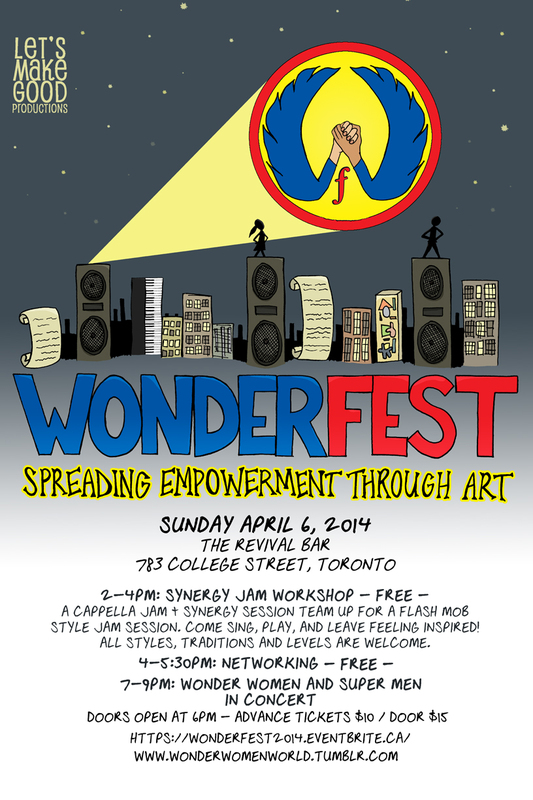 WonderFest happens this Sunday April 6 at Revival Bar in Toronto. Sunday April 6 at The Revival Bar we’re having workshops and networking and concerts, oh my! See artists like: Madette, Brendan Albert, Alissa Vox RAW, Ashley Martinez, Rosita Stone, Candice Sand, Dan Curtis Tompson, Vanessa McGowan, Sarah Jean Villa, Emily Nowicki, Dorothy Knight, Niki Andre, Ernie Vicente, Emilia Heather Hill, Meghan Morrison, and of course Arlene Paculan and Kat Leonard!